Council Member Stephen Levin discusses new sites for the District 14 School. 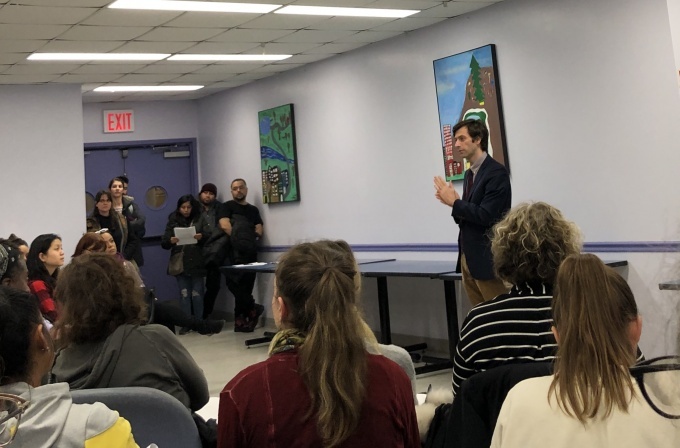 The months-long outcry over a school planned across the street from the toxic NuHart Plastics site continues on after Council Member Stephen Levin held a meeting last week to discuss the upcoming school’s possible relocation. Dozens of residents gathered on Thursday to hear Levin’s proposal for alternative sites that an upcoming K to 8 school, planned as part of the Greenpoint Landing megaproject, could be built over instead of its current siting at the southwest corner of Dupont and Franklin Streets, across from the former NuHart Plastic site at 280 Franklin St. The ground at the NuHart location, deemed a state Superfund site in 2010, is contaminated with two types of dangerous toxins. The toxins have since seeped away from the site and formed a surrounding plume, but have not reached the block where the school is slated to be. The plume, additionally, has not moved in the past five years, but its proximity to a proposed elementary school has been enough to concern many for years, with efforts to relocate the school gathering momentum in the last year. While the former plastics plant is set to undergo an extensive cleanup to make way for a planned two-tower development, the cleanup has yet to move forward, with the developer, All Year Management, inching closer to finalizing a full cleanup plan that is expected to take years to complete. Despite ongoing concerns from local elected officials and community members, the Department of Education told the Greenpoint Post last month that the school will not be moving, and that it are continuing to work with the New York State Department of Environmental Conservation in regard to the NuHart Plastics site. But Levin, who said in October that talks toward moving the school are in motion, rejected the DOE’s stance, and said he would like to see the new District 14 school relocated, echoing the sentiments of many in the area. He spoke to two possible alternative locations for the move during the meeting, which was also attended by Assemblymember Joe Lentol and Alicja Winnicki, District 14 Superintendent, that ultimately demonstrated the difficulties in nailing down a solution to the dilemma. The first proposal involves the school being built within one of the several towers planned for the waterfront on the main stretch of the 22-acre Greenpoint Landing project, being developed by Park Tower. But the council member already approached Park Tower about changing up the school’s location, which turned down the plan and said it preferred to continue constructing the school on the previously agreed upon Franklin Street location. Levin, however, appeared optimistic about enticing Park Tower to make space within another section of the development. He asked the dozens of meeting attendees, many incensed that a solution has yet to be found in light of Greenpoint’s growing class sizes, to brainstorm ways to incentivize the developer on the move, with the most popular result being possibly allotting more development space, or a higher Floor Area Ratio (FAR) amount to Park Tower. A spokesperson for Greenpoint Landing would not comment on the possibility of relocating the school within the complex. “Greenpoint Landing Associates has respected all of the conditions of the agreement to allow SCA to construct a 640-seat, pre-k through 8th grade District 14 public school on the site and will continue to do so,” the spokesperson told the Greenpoint Post. The Greenpoint Terminal Market site, located between Oak and Greenpoint Avenue, was also cited by Levin as another location pursued for the school. The council member has, too, been in contact with Pearl Realty Management, which purchased the property in 2001 for $24 million, after it began looking into constructing residential and commercial buildings on the site. 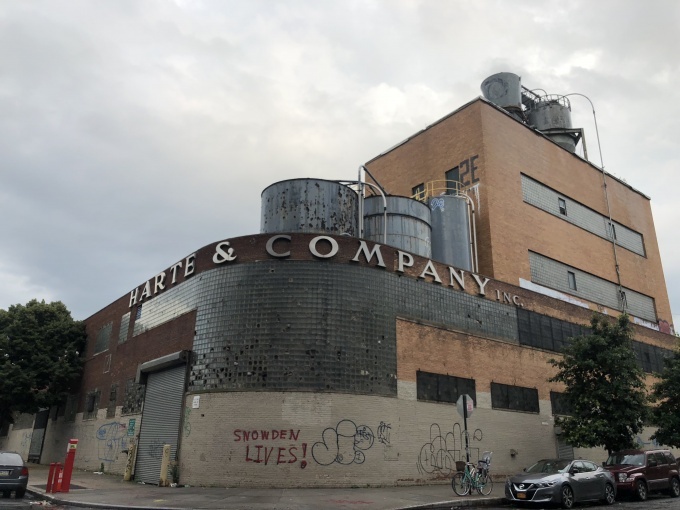 While the Greenpoint council member sees these as viable, potential sites, he says he does not yet know what the environmental profiles of the two sites are, given North Brooklyn’s long industrial history, and what cleanup efforts alone the locations may entail. Among other ideas suggested at the meeting was a type of incubator, or starter school, set up in the neighborhood while a new location for the elementary school is worked out. The local YMCA on Meserole Avenue was put forth as a possible starter site for the school, in an idea taken down by Winnicki. Levin ultimately doubled down on his commitment to relocate the school, and said he would reject the Department of Education and School Construction Authority’s plans if the agencies did indeed decide to go ahead with the NuHart-adjacent site as stated by the DOE. The DOE and SCA did not respond to requests for comment on the school siting after the Feb. 7 meeting. A timeline for the school remains unclear, although Levin said he would like to see a school be built in the next four to five years. It is also unclear if the School Construction Authority has allotted funds toward the school–its location seemingly still being worked out despite opposing statements from involved parties–in its proposed five-year capital plan for 2020 to 2024. The proposed plan, however, has yet to be approved and is still subject to changes. Move it nearer to Newtown Creek, that is only 95% polluted as the NuHart Site. The point being, all of Greenpoint has been ground polluted at some point since 1850 when the titans of business ran wild. Making an educated guess at to what is less polluted than the next site is a crap shoot imo.